Nomad and rural carpets - Kilim World Скъпи клиенти, празничното работно време на Килим World е както следва: 26 април (петък) и 27 април (събота) 11:00ч. – 18:00ч., 28 април – 1 май ЗАТВОРЕНО. От 2 май (четвъртък) сме с нормално работно време от 10:00ч – 19:00ч. Килим World Ви пожелава Весели Празници++++++Dear Customers, holiday working hours of Kilim World are as follow: April 26 (Friday) and April 27 (Saturday) 11:00 – 18:00, April 28 – May 1 CLOSED. From May 2 (Thursday) we are back to normal hours 10:00 – 19:00. Kilim World wishes you Happy Holiday! Номадските килими са ръчно изработени, а едни от първите изработки идват от племето Baluch, населяващи местност близо до границата между Иран, Пакистан и Афганистан. Едни от най-старинните мотиви и символики се изобразяват именно върху номадските и рустични килими. Притежават изключително силно присъствие. Номадски и Рустични There are 215 products. The Bakhtiari rugs are some of the most emblamatic symbols of the Bakhtiari tribe that lives in the Chahar Mahal village of Iran. They're hand-knotted rugs, transported throughout the world since the beginning of the XIX cent. Usually with variety of different colours, floral motifs or depicted animals, holding a devirsity of symbolism. Another typical design is a decorative field with latticed forms. Exceptionally beautiful and symbolic. The city of Hamedan is one of the oldest in Iran, and the rugs that are made there carry its name. Unusually resilient rugs with depicted Nomad glyphs on them. The rugs are completely hand-knotted and the colouring is natural. Distinguishable with the ability to fit in both, a modern, and old interiors. 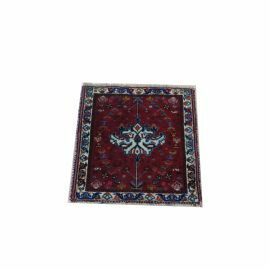 In most cases, these rugs are being made exclusively in small sizes and artistic motifs. The dominating colours are red, brown and dark blue. The pile is real wool or a mixture of wool and goat hairs. Some of the rugs have a cotton pile.